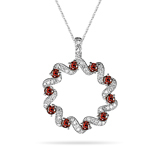 The glazing collections of Red Diamonds Pendants will give an exotic look to your style. The color red will give an alluring look to your skin tone. The diamonds available are of premuim quality giving brilliant hue of the reddish tinge. 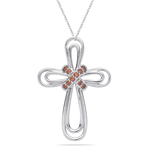 Choose the pendant within your budget. Diamonds appears in different colors due to several factors like; impurities and presence of Nitrogen in place of Boron. The colorless and the diamond which gives a yellow or yellowish brown shade are grouped under certain grades.